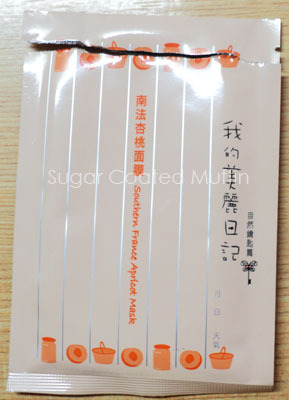 The reason for the big tear at the top is I forgot to snap the photo before opening it =_=" And also I threw away the packaging without taking down the ingredients list so I had to Google it zzz..
*sniff* This mask smells like apricots (duh..). Quite yummy..
Picture of the idiot =_=" Wearing my spectacles while having a mask on helps it to adhere xD Not like it needs help adhering though.. The sheet is very moist and there's enough essence to last the recommended 15 minutes. Yes, just like the other MBD masks, this does leave my skin feeling soft and smooth but if you look closely, it isn't any smoother. Also, I didn't find this to be any more moisturizing then the rest. Perhaps it could have been caused by me using a different moisturizer. My conclusion : Not sure if I'll repurchase. Definitely not the whole box but maybe 1-2 sheets just to try it again with a better moisturizer. i've tried this one too! i must agree that it is only ok, not anything amazing. but i love how it smells though!